The number of search engine users in China reached 451.1 million in 2012. In comparison, 564 million netizens were counted in China by the end of the year. It follows that 80 percent of the internet users used search engines. As of 2011, revenue of search engines stood at 18.9 billion yuan, which marked an increase of 71 percent from the previous year. Advertising revenue recorded a year-on-year growth of 67 percent to 17.2 billion yuan and provided the main source of income of search engines. 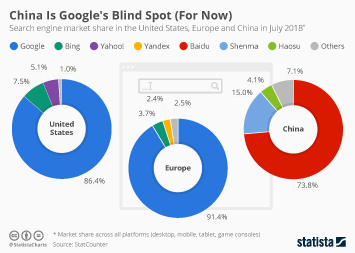 Baidu was the leading search engine in China ranked by revenue, unique visitors, and page view as of 2012, leaving Google in second place in terms of revenue with a 15.8 percent share of the Chinese market. Google occupied fourth place where page view and visits were concerned. After a dispute with the Chinese government over censorship regulations in 2010, Google closed its internet search service in mainland China. Users are now being redirected to its Hong Kong based search engine Google.com.hk. White collar workers represented the biggest group when it comes to search engine users, numbering 182.3 million as of 2011. Nearly 44 percent had a bachelor degree. 66 percent of the users were 30 years and younger. Users of search engines at work and outside of work accounted for 54.8 percent and 33.5 percent respectively.